4 Can I Have Cheese When Dieting? Simple to make yet elegant in presentation, a cheese and grape party tray offers guests a pleasing array of finger food. The secret is to choose the freshest grapes available, and then pair them with a variety of soft-to-firm cheeses. Because there is no cooking involved, even a novice can create a professional-looking cheese and grape tray at a fraction of the cost of a premade deli version. Fresh mozzarella or goat cheese: Both have a soft, creamy texture and a mild flavor. Cut soft cheeses in slices or wedges. Cheddar, colby, edam, gouda, or provolone: These are medium-textured cheeses that can be sliced or cubed. Asiago, parmigiano reggiano, or romano. Hard cheeses such as these should be precut into thin slices. When purchasing the cheese, figure about 3 ounces of cheese per guest, suggests the What's Cooking America website. If you are serving cheese that may not be familiar to your guests, label each type of cheese. However, ensure to offer at least one type of cheese that your guests have tasted before, such as mozzarella or cheddar. Choosing the grapes to use on a cheese and grape party tray depends on your personal preference. However, to offset the bland color of the cheese, select red or black seedless grapes to add contrast to the tray. Alternatively, offer guests a variety of colors and tastes by opting for a combination of green, red and black seedless grapes. Plate only the freshest grapes and ensure to wash them thoroughly before serving. Remove any discolored or wrinkled grapes. Whether you remove the grapes from the stems or lay them on the plate in small bunches is a matter of personal preference. Start with a large, flat tray. A round, rectangular or square wooden tray or even a large cutting board adds to the aesthetics, but a large plastic, glass or stainless steel platter can also be used. Ensure to arrange the cheese and grape tray 1 to 2 hours before serving, as the cheese must be room temperature for optimum flavor. 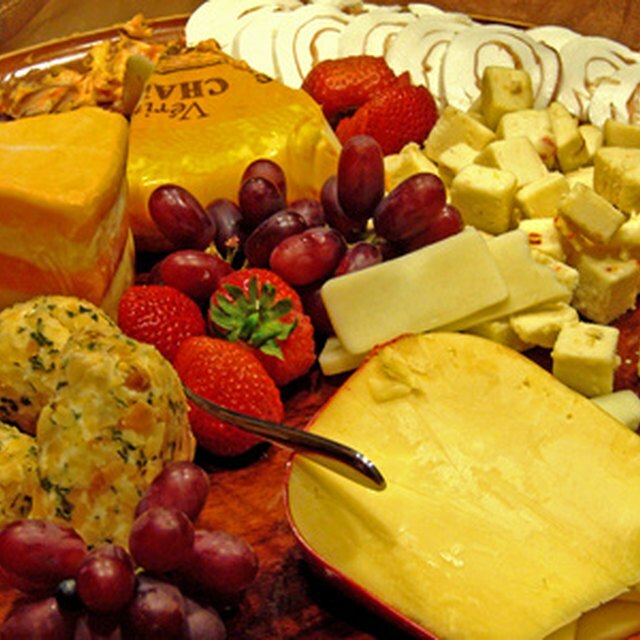 Round tray: Divide the tray into sections by alternating one kind of cheese separated by several bunches of grapes, followed by another type of cheese. If you are serving both sliced and cubed cheeses, alternate the shapes. For example, a section of cubed cheese, then grapes, followed by sliced cheese works well. Alternatively, separate the cheeses with greens, such as fresh parsley or basil leaves, and pile the grapes in the center. Rectangular or square tray: Layer sliced cheese in a row, followed by a row of grapes, and then a row of cubed cheese. Alternate the rows of colored grapes, if you are serving a variety. Keep any wedges of soft cheeses, such as Brie, to the corners of the tray for easy access. Alternatively, lay the cheese in sections around the perimeter of the tray and place the bunches of grapes down the center. It's always a good idea to have a few palate-cleansing foods available when serving a flavorful variety of cheeses. Near the cheese and grape tray, place plates of crackers, sliced artisan breads or baguettes with some extra-virgin olive oil or honey for drizzling. A bowl or two of nuts, such as pistachios or almonds, also serve as palate cleansers. Offer a variety of dried fruits, such as apricots or figs, to enhance the flavor of the cheeses, if desired. Lisa Swickard began her writing career in 1982. She is the owner of Virgin Alley Press, an Ohio-based publishing company. Swickard is an award-winning author who recently released her ninth book. She also is a writer/editor for Tiffin University. Swickard has a journalism degree from Bowling Green State University.